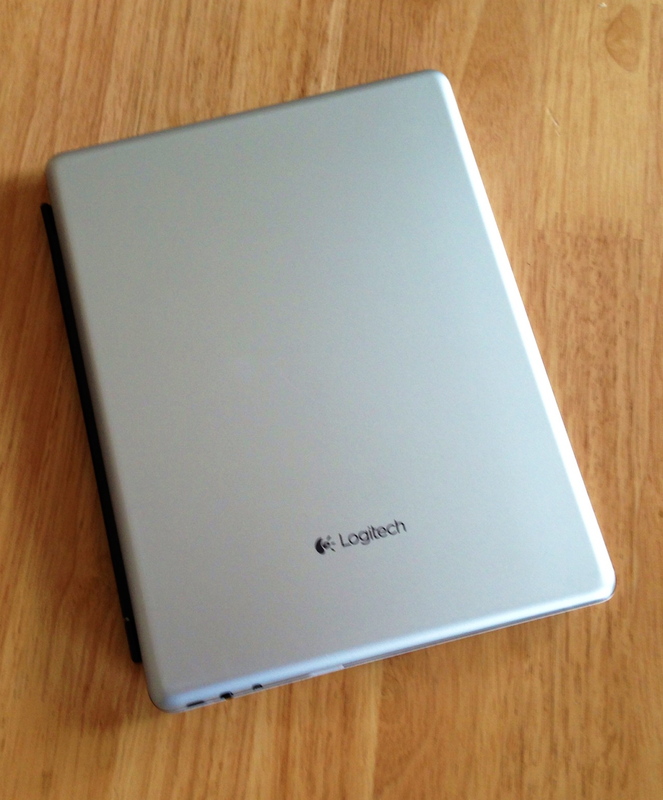 You are here: Home » The Logitech iPad Bluetooth Keyboard – well worth the investment! 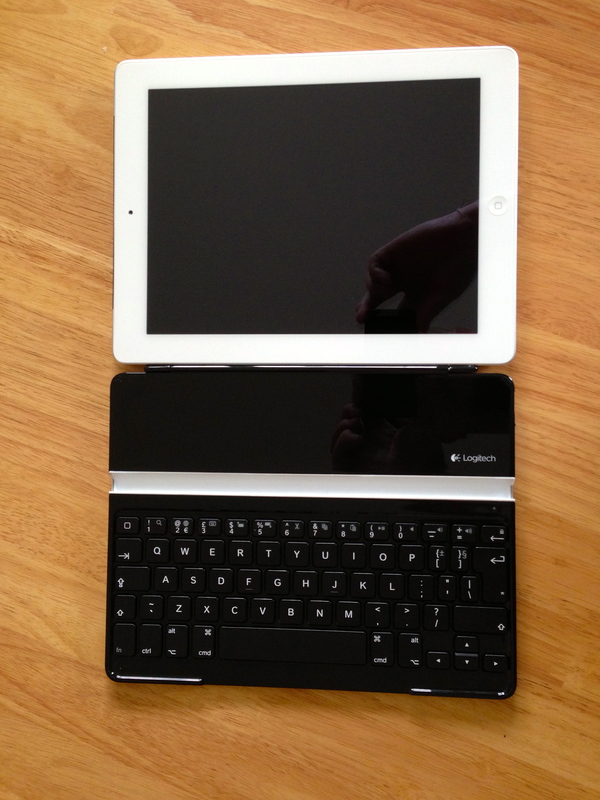 I have tried a few keyboards over the last couple of years for the iPad. Most of them in some type of iPad case\cover incorporating a keyboard but a couple that were stand alone type fold up versions. The case type primarily bulked out the iPad size and did not provide a good enough typing experience to justify the extra size or were completely separate devices so there was the feeling of carrying 2 items around. I also somewhat felt that if I wanted to use a proper keyboard I should just grab my laptop. However, after trying out the Logitech keyboard it has changed my point of view. The feedback and general feel on the keyboard is excellent. 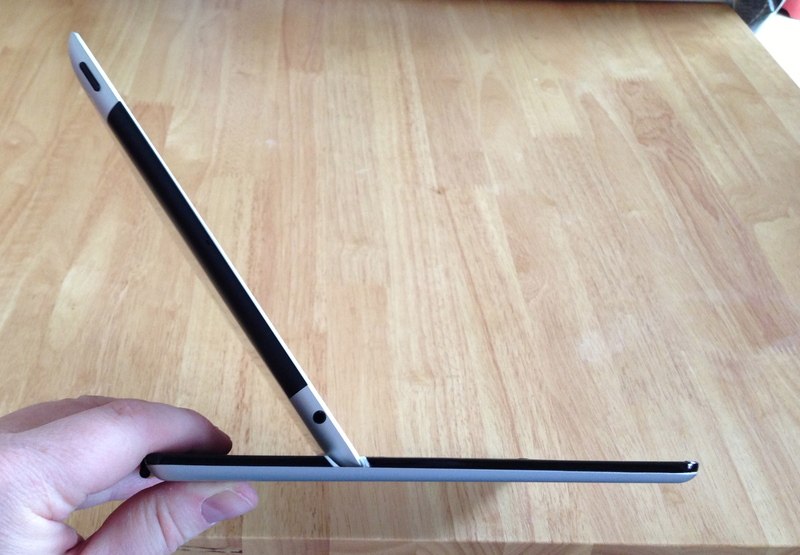 It’s slick design, look and feel make it seem that it was always part of the iPad. This aesthetics and fitting in with the look and feel is generally very important but especially so when it is an Apple product. Yes it does bulk out the size a little and it adds some weight but in my opinion the screen real estate you get back by no longer having the keyboard on the screen and improved usability of the iPad more than compensates for this. 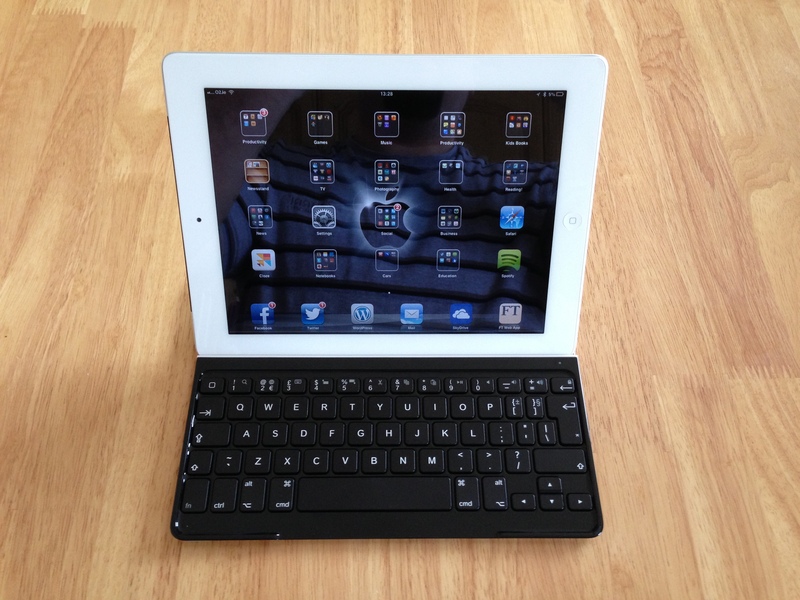 Excellent keyboard with an Apple look and feel. Keys are a hard plastic(resin?) and good enough to touch type versus some of those softer rubber or silicon types. Analogue on/off switch which I really approve of especially when flying. Quick and easy off! I am tired of gimmicky digital switches on so many products these days. And finally it looks excellent! While I definitely recommend it as a tool to enhance the iPad there are just a couple of things that frustrated me. The charger is micro USB – which means carrying yet another cable around. Instead of a charger\cable in the pack I would have preferred a convertor from iPad 30 pin to micro USB so I could carry just one cable\charger (OK yes for latest iPad you would need a lightening convertor). I was also a little frustrated that you have to sit it directly on the very nicely finished Logitech base when using it. There are no silicone feet to raise the keyboard flat base up off a table or other flat surface (even a tiny bit would help hugely) which leaves it prone to scratching and marks and you notice every little spec of dust under the keyboard base when you start typing. So make sure that surface is clean and Logitech please include those little self adhesive feet that come with many other products and I can chose if and where to stick them! Other than that an excellent little product. I too use the Logitech keyboard. iCarbon makes a vinyl skin for the keyboard, so you can get a matching iPad/keyboard combo that adds very little additional bulk to the setup. I tend to fly a fair amount, and the iPad/Logitech keyboard combo works much better on the seat back tray than even my sub-notebook. 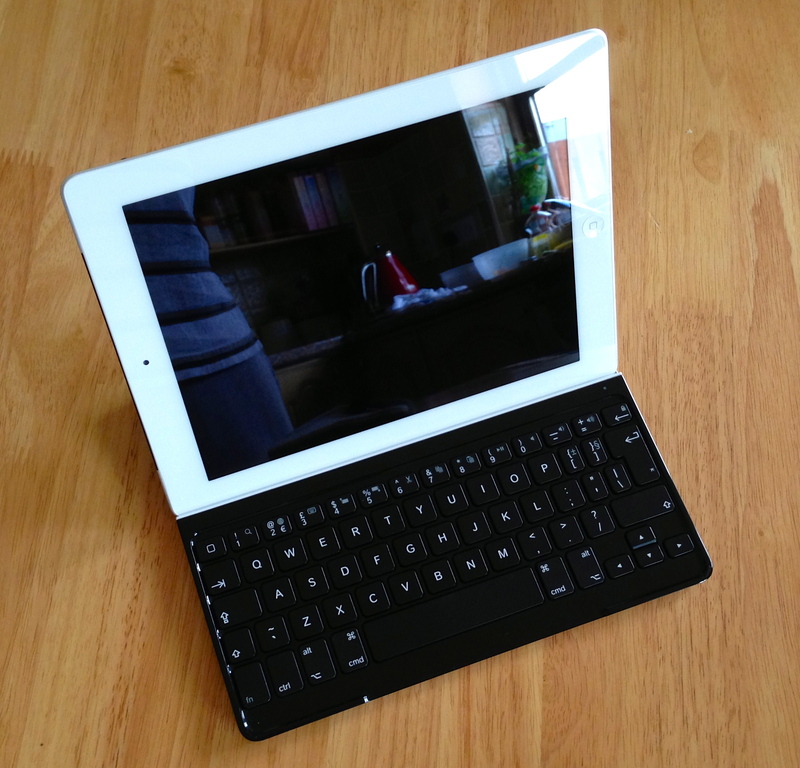 My only complaint is that the magnetic strip that connects the keyboard to the iPad is very weak. You need to be careful when carrying the two attached from meeting to meeting, as they easily come apart. I would highly recommend this combo! And thanks for the advise on the iCarbon. Will definitely look it up….